ADDIS ABABA/PARIS/WASHINGTON - Europe and Canada said they would seek their own guarantees over the safety of Boeing’s 737 Max, further complicating plans to get the aircraft flying worldwide after they were grounded in the wake of two accidents killing more than 300 people. As the U.S. Federal Aviation Administration (FAA) analyzes Boeing’s plans for a software fix prompted by the first crash five months ago, the European Union’s aviation safety agency EASA promised its own deep look at any design improvements. Boeing Co. declined to comment. The company on Tuesday reshuffled the top executives in its commercial airplanes unit to focus on the accident investigations. Black box data was downloaded in France but only Ethiopian experts leading the probe have access to the dialogue between Getachew, 29, and Mohammed, 25. The data was back in Addis Ababa on Tuesday, sources familiar with the probe said. Experts believe the new MCAS system, which is designed to stop stalling by dipping the nose, may have been a factor in both crashes, with pilots unable to override it as their jets plunged downward. The prestige of Ethiopian Airlines, one of Africa’s most successful companies, and Boeing, the world’s biggest plane-maker and a massive U.S. exporter, are at stake. Lawmakers and safety experts are questioning how thoroughly regulators vetted the Max model and how well pilots were trained on new features. For now, global regulators have grounded the existing fleet of more than 300 Max aircraft, and deliveries of nearly 5,000 more — worth well over $500 billion — are on hold. Argus Research cut Boeing stock to “hold” from “buy,” giving the plane-maker at least its fourth downgrade since the crash, Refinitiv data showed. Its shares rose 0.3 percent on Tuesday, to close at $373.43. They are still down more than 11 percent since the crash in Ethiopia, with the company’s market value having tumbled by about $28 billion. 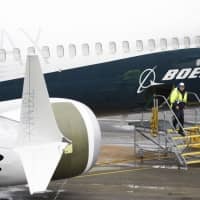 China is looking at excluding Boeing Co.’s troubled 737 Max jet from a list of American exports it would buy as part of a trade deal with the U.S., people familiar with the matter said. Boeing jets were featured on a draft list of American products China would buy to reduce its trade surplus with the U.S., the people said, asking not to be identified discussing private deliberations. Now, safety concerns are pushing China to examine whether to cut the 737 Max from the list altogether or replace it with other Boeing models after the crash of a plane operated by Ethiopian Airlines led to the aircraft being grounded worldwide, they said. A reduction in aircraft purchases could make it harder for China to fulfill an offer it’s said to have made to pare its $300-billion-plus annual goods trade surplus with the U.S. over six years, and potentially delay any overall agreement between the two countries. Worth billions of dollars and a key U.S. export, planes would likely be a key component of any commitment by China to buy more American goods, along with soybeans, meat and natural gas. China’s Ministry of Commerce, which is in charge of the nation’s trade talks with the U.S., referred queries to the nation’s top economic planning body, which didn’t immediately respond to a request for comment. A Boeing representative declined to comment. For Boeing, China’s exclusion of Max purchases in a trade deal would mark another setback for a company that’s reeling from a crisis of confidence over its top-selling plane, which accounts for almost a third of its operating profit. 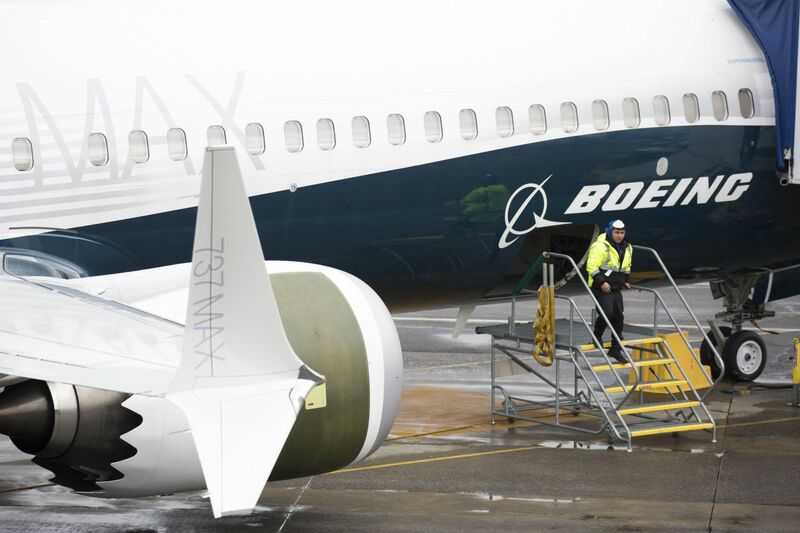 Chinese airlines made up about 20 percent of 737 Max deliveries worldwide through January, according to Boeing’s website. China Southern Airlines Co. has 16 of the aircraft, with another 34 on order. China Eastern Airlines Corp. has 13, while Air China Ltd. has 14, according to Boeing. Other Chinese airlines that have bought the Max include Hainan Airlines Holdings Co. and Shandong Airlines Co. The 737, which first entered service in the late 1960s, is the aviation industry’s best-selling model and Boeing’s top earner. The re-engineered Max version has racked up more than 5,000 orders worth in excess of $600 billion, including planes that have already been delivered. The model duels with rival Airbus SE’s A320neo family in a global, head-to-head competition for sales. While the European plane-maker is increasing narrow-body output at its plant in Tianjin and elsewhere, the 737 Max’s grounding has no bearing on Airbus demand, Chief Commercial Officer Christian Scherer said Tuesday at an event in Taipei. Most of China’s airlines count the government as its top shareholder and aircraft purchases are often coordinated by state agencies including the Civil Aviation Administration of China and National Development and Reform Commission. No other country has more demand for aircraft than China, which is estimated to seek 7,690 new planes worth $1.2 trillion in the 20 years through 2037, according to Boeing’s latest forecast.